How much food does your family need in a week? That depends on where you are (Ecuador or Mexico, Bhutan or Egypt, Chad or Germany) and what you can afford. These pictures below are a remarkable sociological inquiry into what the global food price crisis can mean for families around the world. They can be found in the presentation by Ricardo Uauy (Institute of Nutrition, University of Chile) who draws on the world-spanning work of Menzel and D’Aluisio in 2005. His presentation can be found in the very timely book, Mitigating the Nutritional Impacts of the Global Food Price Crisis, by Elizabeth Haytmanek and Katherine McClure (Institute of Medicine), which can be read as a pdf from the National Academies Press. What does this series of pictures tell us? 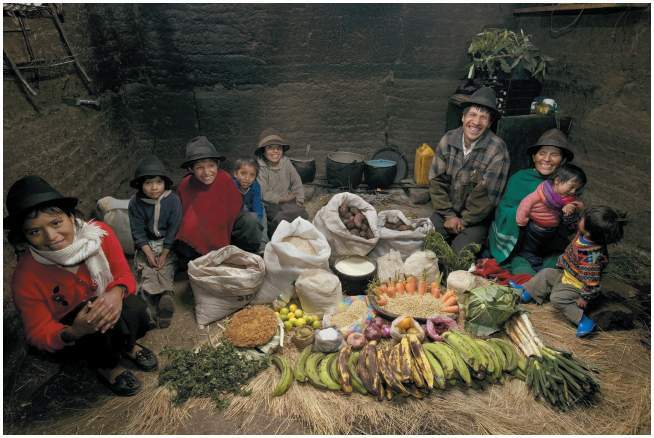 In situations such as Egypt and Ecuador, if it is necessary to make do with a reduced income, it is possible to decrease food quantity without necessarily sacrificing the food quality. Ironically, a reduced income might cause the family to cut out the unnecessary processed foods and soft drinks, which would improve this family’s nutritional status. 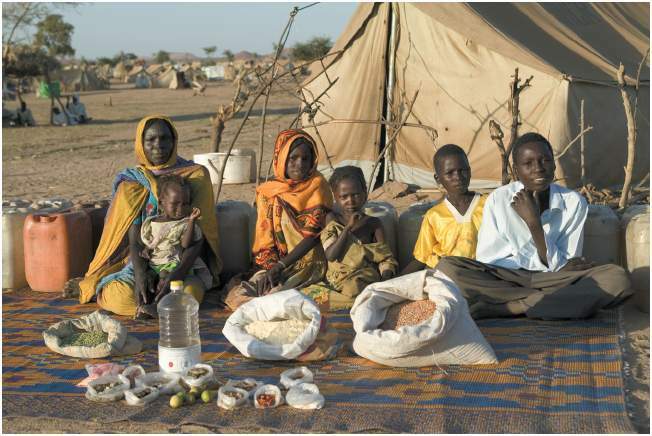 A family in Chad spends only US$1 on food each week. The essence of their meagre diet is cereals and some legumes, and almost exclusively features plant foods. 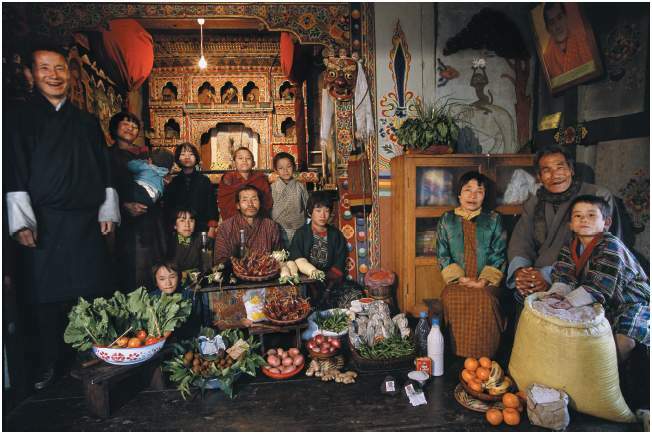 A family in Bhutan can only afford US$5 per week for its food. There is less food overall, and it is basically plant foods, including fresh fruits and vegetables. There are less animal foods, as grains figure prominently. In Quito, Ecuador, however, families spend about US$32 on food, and sacks of cereals, wheat, and some legumes are featured prominently. Less fruits and vegetables are seen as compared to the previous families’ diets. In this scenario where there is less variety, if some foods are eliminated from the picture, the family’s consumption will suffer in nutritional quality. 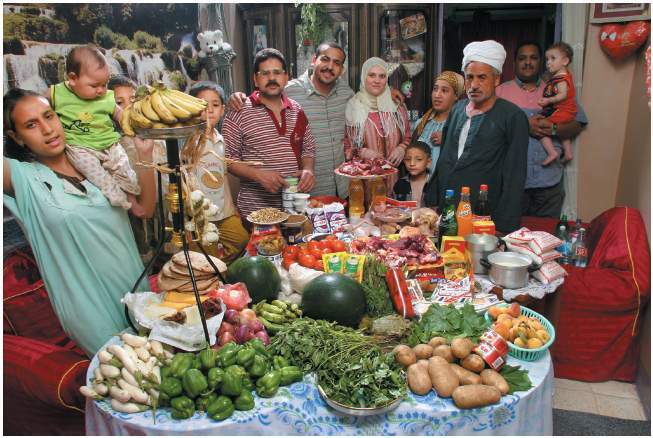 In Cairo, a family spends US$69 dollars per week on food. This amount of weekly expenditure in Egypt still enables a fairly varied diet, with fruits and vegetables seen as prominent in their mix. 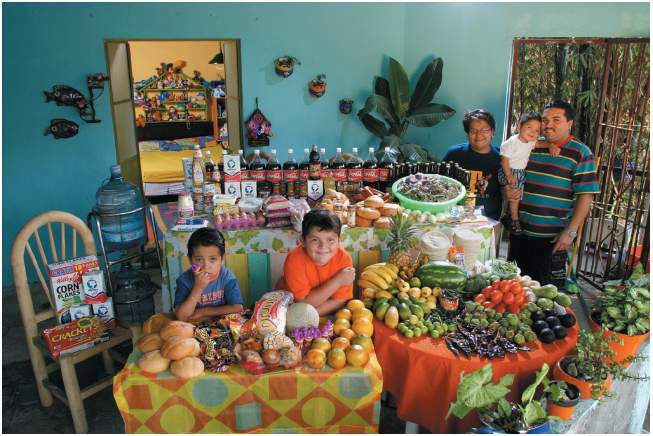 In Cuernavaca, Mexico, families spend about US$189 per week. Here fruits and vegetables are abundant, although processed foods and sweetened beverages figure prominently. In Germany, families spend about US$500 per week to feed a family of four. There is much variety, including a great deal of processed foods, although fresh fruits and vegetables are also prominent in the household. These pictures demonstrate what foods people buy with the amount of money they have to spend on food each week. 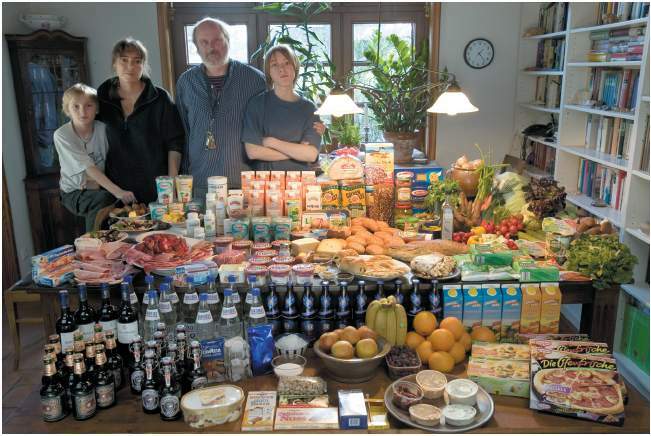 While these photos convey the present status of these populations, they suggest what people might stop buying if they had less money, during a food crisis, for example. In crisis situations, families preserve diets based on less expensive foods. If their income is sharply reduced, families do away with animal foods and nonstaple foods. They eat less meat, less dairy, less processed foods, less vegetables, and less fruits; they are predominately dependent on cereals, fats, and oils. They find ways to get adequate energy at a very low price, but may forego appropriately nutritious foods, which results in poor quality diets that are inadequate in terms of micronutrients. Peter Menzel and Faith D’Aluisio’s book is an around-the-world exploration of average daily life in 24 countries, focusing on food. Hungry Planet: What the World Eats, details each family’s weekly food purchases and average daily life. The centerpiece of each chapter is a portrait of the entire family surrounded by a week’s worth of groceries accompanied by interviews and detailed grocery lists. What about South Asia? In Mitigating the Nutritional Impacts of the Global Food Price Crisis, Josephine Iziku Ippe, Nutrition Manager with Unicef (United Nation’s Children’s Fund) in Bangladesh, explained that issues affecting prices at the regional level include trade barriers, especially with India, and export bans. The large flood of 2007 also affected food prices. Despite this, in 2007, the percentage of food grain imports dramatically increased and reached 6% of total imports compared to 3% in previous years. The food price shock clearly worsened the food security situation in 2008 with 40% of households in Bangladesh reporting that they were greatly affected. Due to the higher food prices, a majority of households in Bangladesh lost purchasing power. In 2008, the real monthly income per household decreased by 12% when compared to 2005 incomes. Real wage rates remained stable while the terms of trade (daily wage/rice price) further decreased in 2008. Moreover, expenditures (particularly for food) increased to an unprecedented level of 62%. of the total expenditures for households. Overall, about one in four households nationwide was affected.